What is an Ozone Treatment? An ozone treatment is when ozone (03) is used to eliminate bacteria, odors, and viruses. An ozone generator is placed inside the vehicle and is kept there for a set amount of time, depending on how bad the odor problems are. As the ozone penetrates the vehicle, the smell will be neutralized and bacteria and viruses hiding in the car will be killed. An ozone treatment is one of the best ways to eliminate stubborn odors. Given that ozone is a gas, it easily reaches inside vents, underneath the seats, and reaches all the nooks and crannies that you are unable to; including saturating upholstery fibers to clean them. How Does an Ozone Treatment Work? Ozone has the distinction of being the most powerful sterilant there is. Ozone breaks down unwanted molecules for the chemical process of oxidation. Ozone molecules are unstable, meaning that they destroy any molecules that they come into contact with through the oxidation process. Ozone is even able to destroy bacteria and viruses by coming into contact with this cell wall and breaking them down on a molecular level, effectively destroying them entirely. When Should I Consider Getting an Ozone Treatment? The ozone treatment will be done by a detailer using an ozone generator. This process generally involves sending specific wavelength UV light and oxygen atoms. 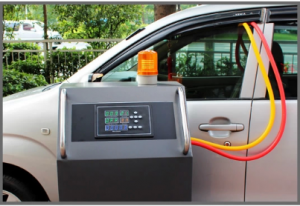 The ozone generator is kept in the vehicle for as long as is needed to eliminate odors. Ozone treatments are permanent, provided that you also remove the source of the smell. The detailer will clean out your car before the ozone treatment. One of the most important parts of an ozone treatment is eliminating the course of the smell. If the problem is mildew, and be sure to deal with the source of the dampness that caused the mildew as well as the mildew itself. Of all the things that cause vehicle odors, one of the hardest to remove his tobacco smoke. Phenol – a chemical contained in second-hand smoke – is responsible for how smoke irritates eyes and throats. Ozone treatments are able to completely oxidize any phenols remaining in the car, which effectively eliminates the odor. The problem should not return in this case because the molecules causing it has been completely eliminated, rather than just being filtered or masked. The ozone gas dissipates around half an hour after treatment, meaning there is absolutely no risk of exposure after treatment. Given that ozone can be dangerous to people, your vehicle is aired out properly before it is returned to you, to completely eliminate this risk.